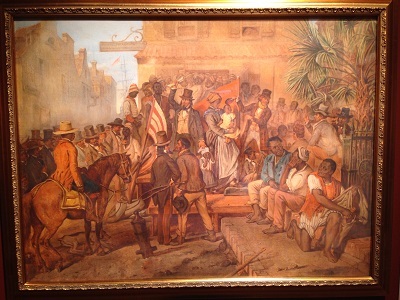 This was one of the first paintings to be finished after Crowe’s return from America. The engraving shown here, ‘from a sketch by Eyre Crowe’, is similar to the painting, but has many differences in detail. 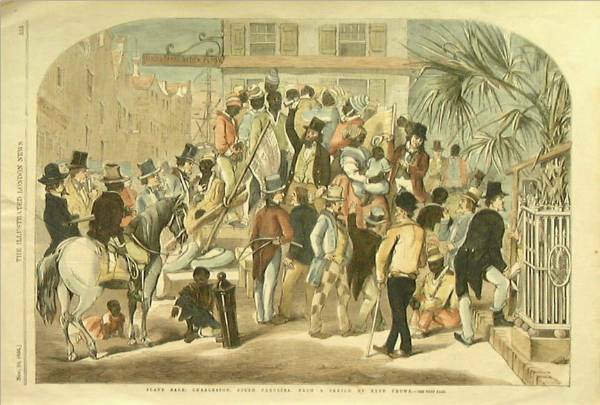 The engraving was based on the actual scene witnessed by Crowe in Charleston in 1853. He published it in the Illustrated London News on 29 November 1856, accompanying an essay which he concluded with a call for greater public condemnation of slavery by the British. The engraving is well known and copies are held by many galleries, print dealers and museums. Sometimes the copies are coloured. Two versions are held at the New York Public Library and appear on their digital gallery.